The Seattle region’s booming economy means more people going to work each day. It also means traffic congestion in the region continues to hit all-time highs. Preheat your oven, roast a chicken, let it rest, carve it and serve it. Play a regulation soccer game (skip halftime). Watch “A Christmas Story,” in its entirety, just in case you missed it Monday. In 2016, you had to budget 94 minutes to drive alone from Everett to Seattle during the morning commute, an increase of nine minutes over two years prior. And it’s not just Everett. 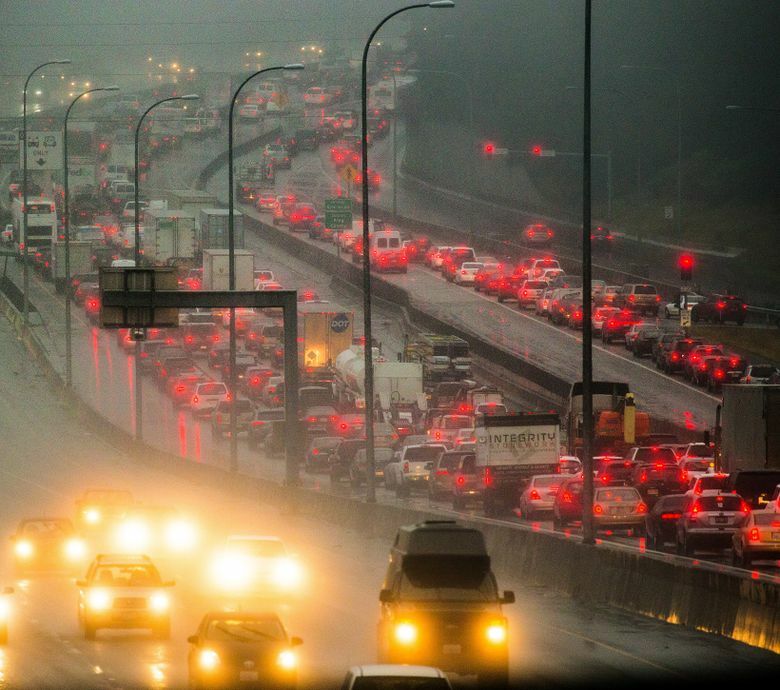 Almost every major commute throughout the Puget Sound region took longer in 2016 than ever before, according to a report released last week from the Washington State Department of Transportation using the most recent data available. 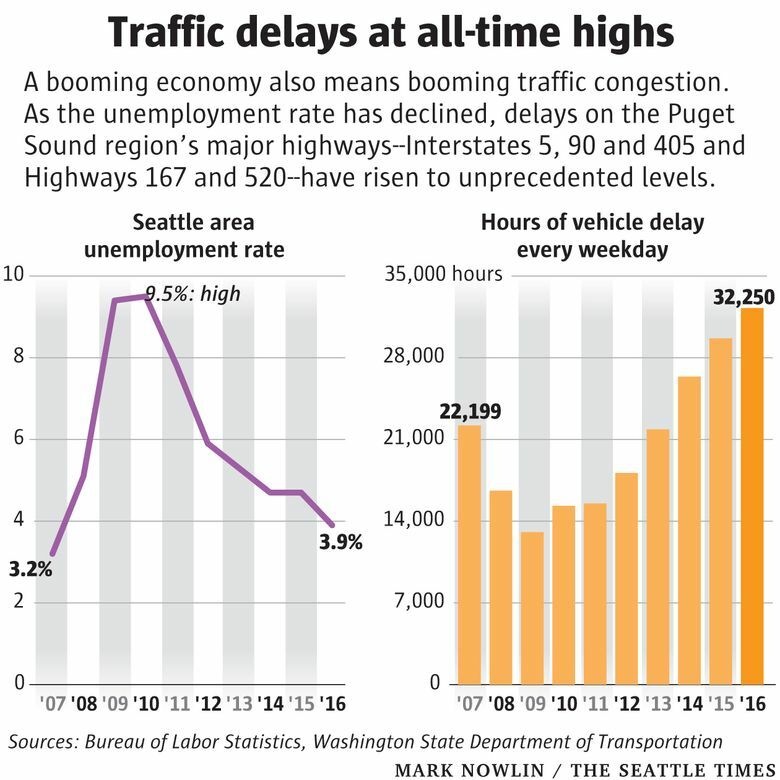 Federal Way to Seattle: Six minutes longer for a reliable commute than in 2014. Tukwila to Bellevue: Eight minutes longer. Bellevue to Seattle: Eight minutes longer. Redmond to Seattle: 13 minutes longer. Olympia to Tacoma: 10 minutes longer. Tacoma to Federal Way: Six minutes longer. A “reliable” commute time, which is longer than the average commute, is how long you must budget to be on time 95 percent of the time. Carpool lanes move more people and are consistently faster than general traffic lanes, but their travel times have also increased. Traffic congestion continues to hit unprecedented levels in the Puget Sound region, according to WSDOT’s annual comprehensive analysis of the state highway system, as a growing population and a soaring local economy mean more people going to jobs everyday on roads that aren’t any bigger. Low gas prices have also made driving less painful, helping fuel congestion. Statewide, drivers traveled farther than ever before in 2016, nearly 61 billion miles on Washington roads, 2 percent more than in 2015 and nearly 5 percent more than in 2014. On the Puget Sound region’s five major highways — Interstates 5, 90 and 405 and Highways 167 and 520 — vehicles sat in traffic delays for more than 32,000 hours every weekday in 2016. That’s a 9 percent increase from 2015. And it’s nearly 2.5 times the amount of traffic delay the region saw in 2009, at the depths of the recession. Over the last 10 years, traffic congestion has moved inversely with the unemployment rate — unemployment rises, traffic falls; unemployment falls, traffic rises. “Higher employment rates would translate into more people driving to work during the peak commute hours,” Gangula said. And, even beyond employment rates, there are just more potential drivers here than there used to be. The Seattle Metropolitan Area, which stretches from Tacoma to Bellevue to Everett, added 100,000 driving-age residents between 2014 and 2016. And while transit ridership continues to increase, both locally and statewide, it is not doing so uniformly. Transit use declined in 2016 along the 520 corridor connecting Redmond and Seattle, along I-90 between Issaquah and Seattle and along 167, between Auburn and Renton. A possible reason: 16 of the 19 park-and-ride lots along those routes are over capacity. There is only one major highway in the region that does not now have congestion at all-time highs: Highway 520. Congestion on 520 plunged as tolling went into effect on the 520 bridge in 2013, and while it has inched up since then, it still is less than half of what it was in 2007, before the recession. But all those cars didn’t just disappear: Congestion on I-90, which runs parallel to 520, is close to double what it was just before the 520 tolls went into effect.